​has a 95% success rate! ​your diet, lifestyle, makeup, etc. 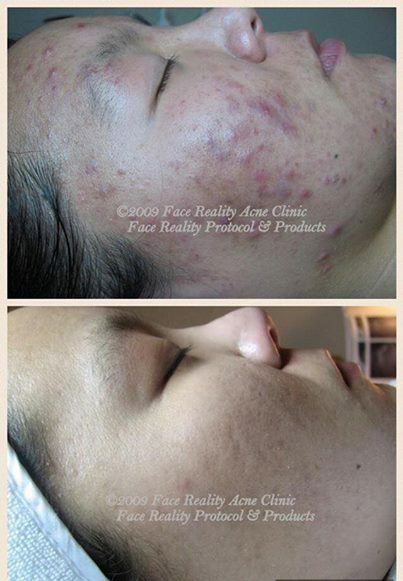 The ‘FACE REALITY’ Acne Program has proven to work with a success rate of 95%. ​ Most see a significant improvement within 12 weeks! Acne is a mysterious disorder, but one thing IS for sure – it can be controlled with the right combination of products used in the correct way. Just as in a clogged drain, the pore must be treated with products that unclog it, keep it unclogged and kill the acne bacteria. Face Reality Acne Program gives you the tools and treatments to do just this. 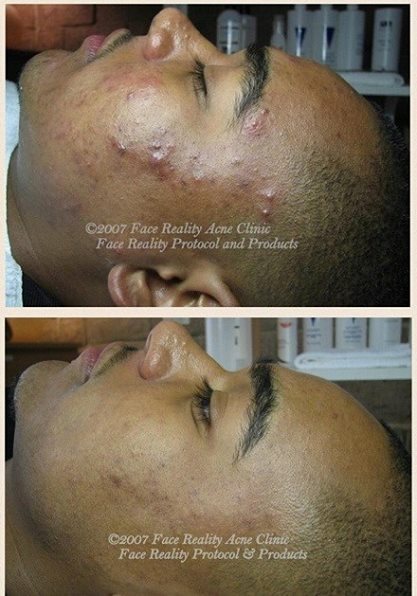 Face Reality Acne Program specializes in treating moderate to severe Inflamed, non-inflamed and combination acne. It has a clear-skin system that will have your acne under control in about three to four months depending on your type of acne. It combines the power of clinical-grade homecare products that are customized for your type of acne and skin with a series of bi-monthly or monthly treatments that facilitate the clearing of your skin. We also teach you about other aggravating factors that make you break out – foods, medications, cosmetics, stress, and common ingredients in skin care formulations that might be clogging your pores (even professional and prescription products!). We hand pick your homecare products after analyzing your skin and doing a skin test we perform at your first treatment. Your homecare products are specifically formulated for acneic skin and guaranteed not to clog your pores. Your homecare use of ONLY these products will be used morning and night, combined with in-spa treatments will bring you to the result you have been hoping for – clear skin! * FYI: For those not interested in the Face Reality Acne Program, but still want an Acne type facial, you'll want to choose the 60 min Facial. This will block out enough time to address your concerns. If scheduling online, include in the 'notes' section, that this is for Acne. If calling, let the person know making the appointment for you that the facial is for Acne, but NOT the Face Reality program. SPECIFICALLY FORMULATED ACNE PRODUCTS– We use skin care products that are specifically formulated for acneic skin and guaranteed to not clog your pore. DIET/SUPPLEMENTS/MEDICATIONS– Together, we will try and figure out what is all contributing to your breakouts, not just the outside, but also from inside. People who are prone to acne have many things systemically going on which is where the detective work comes into play. There are foods, which are known to cause problems to acne prone. We will also go over supplements that could be a problem/solution. Some medication (example: certain Birth Control Pills) can have a side effect that could be causing your problem. LIFESTYLE– Some lifestyle can be a problem if you are acne prone. Are you a swimmer who is in the water with chlorine which can be a problem with acne prone? Are you a football player and breakout on the face where the helmet touches? We will go over what can be done to prevent and change in order to get your acne under control. SUPPORT– Your esthetician/acne specialist is your ‘Acne Coach’. We are here to guide you to the clear skin you want! We understand that acne can be debilitating and it’s stressful if you are struggling by yourself. This is team work! ONLY USE PRODUCTS WE RECOMMEND - Our program is a combination of receiving a series of acne treatments in conjunction with daily use of the homecare products recommended by our esthetician/acne specialist. Once you agree and commit to our acne program, you WON’T be using ANY products that are not recommended by us. LISTEN TO OUR GUIDANCE - We need your willingness to receive and listen to our guidance. We are here to help you clear your acne. Acne is our business, so we continue our education to keep you and other clients updated on the latest developments/findings regarding acne. EXPECT SOME DRYNESS & FLAKINESS - All acne remedy will cause some dryness and flakiness, so please know and expect some dryness and flakiness during this program. COMMIT 100% - Our ‘Acne Program’ is a proven program to get your acne under control, BUT…it will take your commitment to do that. So, if you’re ready to commit 100% when you make your appointment, we too are READY for you!! We’re excited to embark on this journey with you and we’re here to help you 100%! It might sound or seem a little overwhelming at first, but soon it will be a part of your daily routine. You’ll have your acne under control once and for all in just a few short months. ARE YOU ON PRESCRIPTIONS OR PREGNANT/NURSING? you will need to discontinue using 14 days prior to coming in. If using Accutane, you need to stop taking 3 months before you start the program. If you are pregnant or nursing, you need to have your doctor’s OK before you start the program. ​Some treatments and products in this facial are not advised. Time to discuss your current skincare regimen, acne history, lifestyle, diet, and medications. We’ll cleanse the skin, do a skin analysis and skin sensitivity test. This option is for those not quite sure they are ready to commit. It’s a great way to come in and find out what our acne program is all about and allows you to get to know your esthetician/acne coach. Discuss skincare regimen, past procedures, skin analysis, skin sensitivity test, valuable information regarding products, diet, supplements and medications. Acne treatment includes: Cleansing, exfoliation, extractions, customized acne products, LED light therapy, and show you how to exactly use the products recommended. To get your acne under control, we need to monitor your progress and possibly adjust your homecare regimen every 2 weeks or once a month. We will analyze your skin at the beginning of every visit to assess which treatment would serve you best, and determine what changes need to be made to your custom home care routine. It is important that we see you every two weeks to assess your progress and how your skin is responding to treatment. Most see a significant improvement in 8 to 12 weeks.